I grew up in Gibraltar in the 1980s in what seems like an entirely different country. 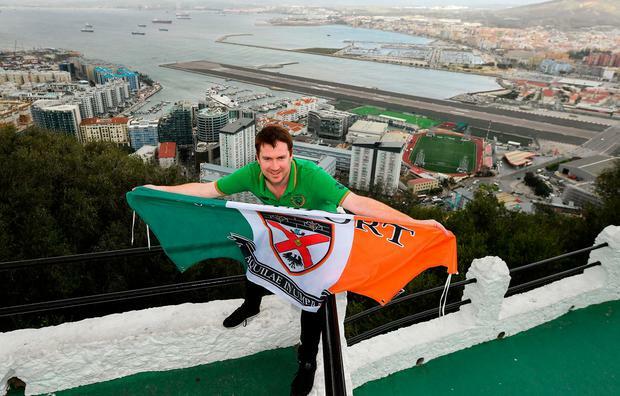 I certainly never imagined I would be living in Ireland and looking forward to Gibraltar hosting Ireland in a European Championship qualifying round. You can see the Victoria Stadium from the plane as you come in to land and the planes sometimes struggle with crosswinds swirling round the rock. The team and fans will have to wait for the barriers to open in a unique level-crossing airport, driving over the runway itself. The forecast doesn't look too windy so those crosswinds shouldn't be a problem, but it does look like it will be a muggy 17 degrees with rain, which will have to be factored into plans. The artificial pitch when wet will mean the ball will skip awkwardly and be difficult to control. A tight, quick game will make the most of the conditions. The same football pitch that Ireland will be taking to today was used for club games, sports days and everything in between. It's the same pitch that almost all Gibraltarian kids will have played on at some point, a younger me included. I went to the same school as most of the Gibraltar players - there are only two secondary schools in Gibraltar (a boys and a girls), so there isn't much choice in the matter! It was in this stadium that Lee Casciaro scored a famous goal in 2015, shocking Celtic with a win for Lincoln Red Imps. Lee was playing then with his brothers Kyle and Ryan, all of whom have played for Gibraltar during their careers. I say careers, but they all hold down full-time jobs, as policemen and a shipping agent. This is pretty typical of the Gibraltar side, although only Lee is in the squad named for this game. I used to spend New Year's Eve celebrating with the Casciaro brothers but this is somewhat typical in Gibraltar, with such a small place and a population of only 35,000 most people know each other pretty well. This closeness of the players to the fans, coupled with the fact that it's a qualifier finally held in Gibraltar itself, means it's a very special game to Gibraltarians. The World Cup qualifiers were held four hours' drive and two countries away, in Faro, Portugal. The Gibraltar players have always played with heart and passion, but there is a real sense in Gib' that this game is different. This is the same Gibraltar team that beat Liechtenstein 2-1 in October last year and Ireland fans will cringe at the '90 minutes of madness' that took place over in Liechtenstein in '95. My father, who still lives locally, sent me a picture of the local Irish pub, O'Reilly's, on St Patrick's Day. It was packed with people spilling out into the sunshine with green-trimmed hats and pints of Guinness. All I sent back was "wait until you see it on Saturday". As much as I'm hoping for Ireland to get a tough time on the pitch, the fans will be given a warm reception off it.